I've been a Trim Healthy Mama for about five years now. Well, to be clear, I wasn't “Trim” that entire time, but I was getting there! As I've shared before, I got to my goal weight after several months and easily maintained that weight loss with Trim Healthy Mama. When I first got started, I struggled. And when I'd fall off the wagon, I'd struggle again. But I stuck with it, and I'm so glad I did! 1. Start with breakfast. When I started THM, I was a bit overwhelmed. By starting with just one on-plan meal a day, I was able to adjust more easily, and really understand what true “S” and “E” meals are by keeping it simple. Bacon and eggs is a great, easy S, and an excellent way to start Trim Healthy Mama. Once I had breakfast down, I started eating only on-plan snacks, then I added lunches, then dinners, and before I knew it the weight was melting off! 2. Makeover recipes you already use. I'm as tempted by Pinterest as the next girl. And when I started looking at online forums, I knew I'd have a hard time figuring out which meals I could eat. I also started to feel like I was spending hours in the kitchen. So I started looking at recipes I already used, and that my family already loved, and realized that I could THM-ify our favorite meals with little effort. For example, if I made tacos I could just skip the tortilla for an S. If I made steak, potatoes, and veggies, I could let my growing kids have the potatoes and stick to steak and veggies for myself. Instead of ground beef, rice, and beans (crossover), I switched to chicken breast, brown rice, and beans (E, swapping a leaner protein for the fattier ground beef). Favorite salads were naturally good S meals, and my all-time favorite Alfredo sauce recipe from Pioneer Woman still worked as a heavy S over Dreamfields noodles or spaghetti squash for a gluten-free option. By making over recipes that we already used, I learned that THM can be simple and easy. 3. A little prep goes a long way! If I spend about 1/2 an hour to an hour in the kitchen every week, I can bake some chicken to keep on hand for easy salads or wraps. I can make a dessert, or slice some cheese cubes and veggies for snacks, and have it all in the fridge, ready to go. One of my favorite things to do is make a few batches of Oopsie Roll Eclairs from the THM book, omitting the chocolate. They freeze well, so I can keep a half dozen in the fridge and the rest in the freezer to eat with berries for a quick, protein-packed snack when I'm in a rush. Even better, I make three dinners instead of one at a time which helps me to stock my freezer with healthy dinners. I have meal ideas, menus, and shopping lists in the Menus and Meal Planning section. 4. Eat at home. I'm not saying you can never eat out as a Trim Healthy Mama. Not at all! In fact, I offer a free download with THM-friendly restaurant choices. But for me, when I'm eating out, I have a much harder time dealing with temptation. Eating at home as much as possible keeps me on track and aware of what I'm eating, without the extra temptation of fries and sugary desserts. 5. Speaking of desserts, find a favorite! I have a few go-to desserts that keep me sane (and from driving to Cold Stone whenever I get the urge). My all-time favorites are THM's Twixter Bars and these Pumpkin Cream-Cheese Muffins from AllDayIDreamAboutFood.com. One of my favorite super-fast dessert recipes is my low-carb Brownie Batter in a Mug (which was also published in the book Trim Healthy Table!). 6. Stock up on drinks – If you're a soda addict, you probably need to keep a few alternatives in your fridge. It's helpful to have something ready to grab and go when you leave the house, even if it's just a bottle of water to help you resist temptation while you're out (it also helps to save money!). Here are my favorite THM-compliant drinks. 7. Exercise. You can do it! Even if it's just walking, getting moving will help you a ton! It improves your energy levels and keeps you motivated to eat healthy. There are great suggestions in the Trim Healthy Mama book, plus I have a list of my favorite quick and effective exercise programs here. 8. Keep convenience foods for emergencies. ALWAYS have healthy snacks available! It could save your waistline and your health! Here are 31 snack ideas for THM to get you started. I keep Quest bars in my cavernous, already over-stuffed diaper bag, and before I was totally gluten-free I used to buy Dreamfields pasta and Joseph's Pita Bread. Update: If you struggle with sweeteners, give Trim Healthy Mama's Gentle Sweet a try! It's my favorite, and I like it far better than Truvia or anything available in the store. If you're recommitting and need a fresh start, I can help! I'll send a free Fresh Start Mini-Guide straight to your inbox with a free one-day reset menu and a printable version of my best tips! Tips for making lunches for hubby or kids? I agree. This is the best THM article is have read thus far. It is simple, useful information with great links. Thank you for this great article. Thanks so much! I’m glad you found it helpful! Thank you so much for sharing your tips! I’ve been on THM for a little over a month and am starting to get into a rut. I loved your comments about THM-ifying your favorite recipes and doing some prep work. That will really help me to keep going strong. I did that, too. It was easy to get in a rut and eat the same things over and over again, and then I got bored. Then I realized I was over-thinking it. But THM is so worth it! I’ve never been able to keep weight off so easily before, and now it feels easy! Good luck to you; hang in there! I shared this on Trim Healthy Mama SoCal group thank you for your advice. Thanks! I hope it’s helpful to someone! Thanks for this. I am considering THM, but have been overwhelmed by the options. This should help. THM CAN seem overwhelming at first, but once you get it, you get it! It will become second nature before you know it! Thanks for sharing. I’ve been doing THM ip since May, but lately it’s been really hard to stick to it while running around with three little kids. I needed a boost to help get me back on track and I love your tips. Thanks for encouraging us and also for the links! You’re welcome, I definitely know how it feels to be busy and get sidetracked! I’m glad this was helpful to you! Thank you for writing this article! We are going to be re-starting our THM group here in the Shenandoah Valley of Virginia in January. The timing of your article is perfect and will help us in setting up a successful platform to re-new and get reacquainted with THM. I’m struggling with when to do what meals. Do you rotate the E and S for meals and snacks each day? I know I must have missed this in the book. I am getting a good grasp on what the E S and other meals look like just not sure when to eat what if that makes sense. E breakfast S lunch and dinner then what about snacks and dessert? Yes! So in the book it’s called “Freestyling.” I had to adjust the types of meals I ate from time to time. When my weight loss would stall, I’d add a few more E meals a week and see how that went. I also stuck to FP desserts to keep from calorie overload. When my metabolism was really hot and I lost the most weight, I was switching from fuel type to fuel type at random. One thing I know for sure is that when I only ate S breakfasts, I didn’t do as well as when I would switch up my type of breakfast during the week to keep my body guessing. By the time I got to goal weight, I was eating at least 5 “E” meals a week, with at least 2 FPs (like the big FP salad in the book), and the rest were S. But that could be different for each person! You have to jump in and see what works best for you, and be willing to switch things up if you stall. Thanks so much for this article. 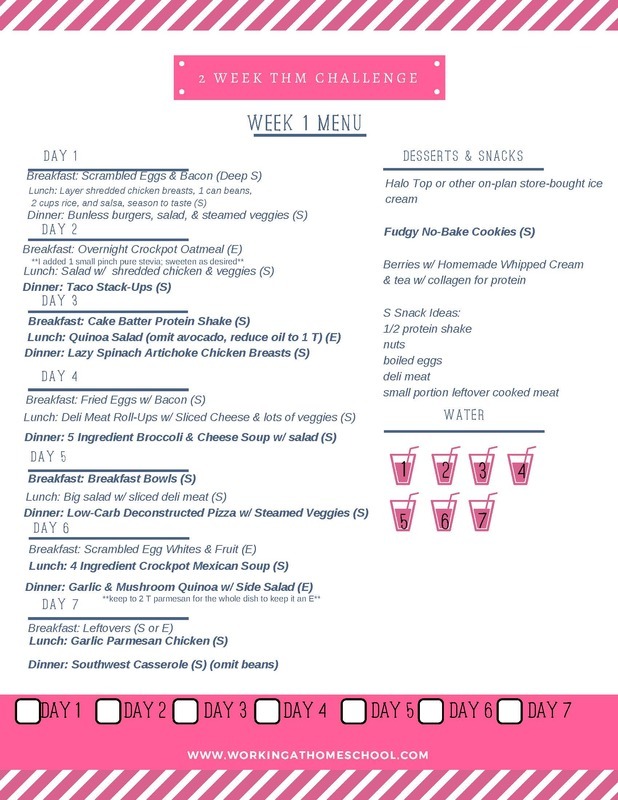 I’ve been working my way up on the THM plan for 2 weeks and started feeling a little overwhelmed with the options, supplies needed and keeping the E and S meals straight. This article helps tremendously! I’m glad I can help! It seems overwhelming at first, but about a month in it really clicked for me and became second nature. Thank you very much for your article. I have been reading so much that my head is spinning! My problem is some of the food ideas that I do not care for, but your article about eating from the foods I did before made me relax more. I am in my late sixties and my husband is in the 70’s so it’s more one step and one day at the time. Thank you again. Thank you so much for writing this, I anticipate coming back to this very often. I am just getting started and really hope this helps me feel better about myself! The recipe for Skillet Chocolate Chip Cookies calls for Swerve sweetener. Is that an approved sweetener for THM? I’m just on my second day so I am a newbie. Yes, swerve is made with erythritol and it’s on-plan. I was intimidated, too, at first. Then I realized that SO MUCH of the book is recipes, and that helped me realize that I didn’t have to read the whole entire thing to get started! I think if you take the basic steps of eliminating wheat and sugar, then separating your meal types as the book describes, it might help. Taking one meal at a time really helped me, too. Hi there! Thanks for all the good tips! I just finished reading the newly revised THM book, but am still a bit confused. I don’t know when you would decide to choose an E meal over a S meal (or FP meal). For example, would you choose an E meal before exercising since you may need more carbs? Would you not want a heavy S meal before sleeping? Everything else seems to make sense except for trying to decide when you would eat a particular meal type. Help!! Thank you! You’re on the right track! I usually do eat an E before exercising, then an FP after for more protein (like a Big Boy Smoothie). Other than that, I really try to listen to my body. If I’m feeling sluggish or slow, I usually need an E meal. If I’m just feeling hungry, I stick with S. I usually need 5-8 E meals per week to keep weight loss going, but everyone is different. I would try to start with S, then add E meals and pay close attention to how you are feeling with each meal type. If you are trying to lose weight, definitely throw in an FP here and there. The idea is to keep your metabolism “hot” by switching up the types of meals you eat. Hi! I just came across this, thank you! I have read the books but either I’ve been super tired or my kids were constantly interrupting me, so I have a few questions…I don’t know anyone on the plan and I have been unsuccessful with the THM FB page, so maybe you can help me out? From what I understand I eat either an S or an E meal. I have a lot to lose so Crossovers will be for the family only…but what is an S Helper and when do I need those? Am I missing anything? I have a tendency of over complicating things but I don’t want to over simplify either, lol. I really enjoy your blog, I am a Homeschooler also. Thank you! Sure! Don’t get caught up in S Helpers just yet. You’re main three meal types are S, E, and FP. When you get to your goal weight, you’ll want to add S Helpers and Crossovers. I turn S meals into crossovers by adding rice or potatoes for the kids (this also makes the meal stretch so we don’t have to have as much meat), and for E meals, they have milk or full-fat dairy. For example, if we have burrito bowls (black beans, brown rice, and chicken breasts with salsa) that’s an E meal for me, but I’ll add cheese and sour cream to the kids’ bowls to make it a crossover. I hope that helps! I’d be happy to help if you have any other questions. Thanks for stopping by! Can you please comment on how often and when snacks are used? My former plan had me eating every 3 hours, so I am guessing this is how snacks fill in the gap between meals. I also am really confused about desserts. It seems like so many of the recipes highlighted are sweet things. To me, this is almost a trigger (like the I can’t have just one diet soda either… sigh). Thanks so much for your willingness to share. I am really working at getting a good plan in order for our entire family. Every three hours is great, and works on the Trim Healthy Mama plan. Sometimes I feel like I can’t quite get that much food in, and that’s ok. But switching up the fuels and keeping your metabolism guessing frequently is one of the things that makes this plan work so well! You definitely don’t have to eat any sweets at all. I use the low-carb sweets as replacements for the sugary stuff, but you can definitely skip those if you think they will cause sugar cravings. The best way to make sure you kill those cravings is to stick with “Deep S” meals (high quality fats, low carbs, without tons of calories) and tons of water. Unfortunately, Truvia Baking Blend is real sugar mixed with stevia, so it isn’t likely to help you lose weight. I’m sorry; I know that’s frustrating! I bought a bag of that, too, when I first got started with THM, and I went ahead and used it up. I didn’t really get good results until I switched to pure stevia extract or regular Truvia in a tub. Next time you’re shopping try to avoid the Truvia Blends, though. My favorite sweeteners are the Trim Healthy Mama brand Gentle Sweet and Super Sweet Blends. This is my link: https://store.trimhealthymama.com/#_l_6a , but I know it’s hard to buy special ingredients at first. Just a word of warning – for the first few weeks I didn’t love the sweet stuff at all. Once I detoxed from sugar, I started really enjoying the sweet desserts and stuff. I’m so glad you’re starting with breakfast, that was really what got me on the right path! Hi Rhonda! OK, so for the first part you wrote – please don’t do only S meals. That is similar to any other low-carb diet and might move the scale a little bit, but it’s not sustainable! I did the same thing it sounds like you are doing and only did S meals for awhile. I lost some weight, and it came right back on. I couldn’t figure out why! I re-read the Trim Healthy Mama book and realized that I really needed those E meals and a few FP meals to keep my metabolism guessing. Sure enough, with about 5 E meals per week, I saw steady weight loss that stayed off! As far as exercise, if you are already used to exercising, Pretty Fierce is great but there is a lot of emphasis on postpartum workouts. One of my favorite things to do is exercise with free Fitness Blender workouts on my computer (they are on YouTube). I stick to the HIIT workouts under 30 minutes, and they are very challenging and have worked well for me. If you are newer to exercising, you might want to try Fit2Be or T-Tapp – both are great, gentle introductions that can then prepare you for a more strenuous routine if you want one. And this is the part where I have to make sure I clarify for legal reasons that I’m not a doctor, nor can I give any medical advise, and you have to work out at your own risk and talk to your doctor before starting a new exercise program…I know it sounds weird that a blogger would have to say that but my lawyer friend says I must! 😉 I hope that’s helpful! I have one more question, Jen, if you can help – I am 59 years old in very good health. I do running/walking intervals on a regular basis. I’m looking at the Pretty Fierce workouts that you recommend. I know a lot of it is done for post partum moms wanting to get into shape. Well that’s me too, only about 32 years later. I have 30 to 40 pounds to lose and I’m ready to be diligent about being in my best shape before my 60th (jan 2017). Just wanted to get a little more info on these DVDs before I order,. I want good HIIT workouts as I know they are most effective. I want the most effective workout that I can couple with THM.. Thanks again. I’m sorry! I’m trying to cut down on the number of ads; but the ads are what allows me to pay for the website’s hosting and expenses. That’s great that you’ve stuck to it so well, Jen! I notice that I always lose far more consistently when I make sure I do the THM plan the way it was designed, with S, E, and FP. The food lists in the original book can give you good ideas for what to eat for each fuel type. My 15 year old daughter is overweight and has hypothyroid problems. Her new doctor suggested the Paleo diet. I have been on THM for 14 months, have lost nearly 30 pounds, and “think like” a THM. My question is this – How does the Paleo and THM diets compare? Hi Rachel! I think Paleo is great for eating natural, whole foods. However, my personal experience with the Paleo diet did not result in any weight loss. It does help some people to lose weight, but I think THM is superior for weight loss because of the balance. One option is to eat the THM way with Paleo foods. Just take the Paleo food list and compare it to the THM food lists (I would write S, E, or FP next to each food on the list of Paleo foods). Then you can still combine the on-plan Paleo foods into S, E, or FP, and get the weight loss benefits as well. Just a thought! Thanks for the advice. I’ve been on THM for so long that I “think that way!” So, when Paleo was telling me to combine certain foods…I knew I’d have a hard time with it. 🙂 So, I think I’ll take your advice, look at the Paleo list, and try to do a combination of both. I have one more question…I’ve been at a PLATEAU for several months now. I still need to lose another 15 pounds. How can I get the pounds moving again? Thanks. Stumbled upon your site today. These tips are terrific. Thanks so much!! I’m so glad they were helpful! Thanks, Cheri!